Jodi and I went to the race expo yesterday to pick up my packet, her sisters packet and a friend of her sisters packet. It was fun to look around, but didn’t take long because it was small. Jodi did find some Nike shoes for $50, and I found a shirt and BIC band for my hair…I tested it out yesterday when I got home and not even Sky could dislodge it! That thing is awesome. These pics are in no kind of order that makes any sense. 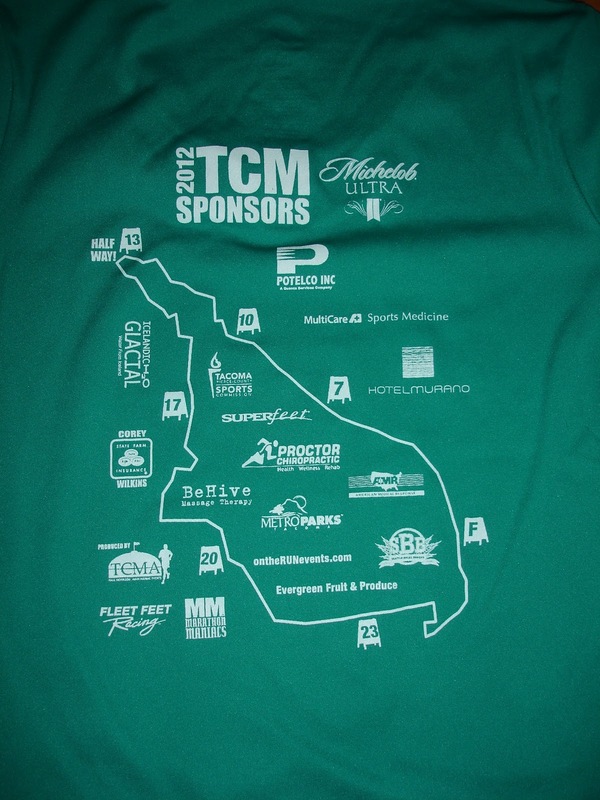 Back of the event shirt. 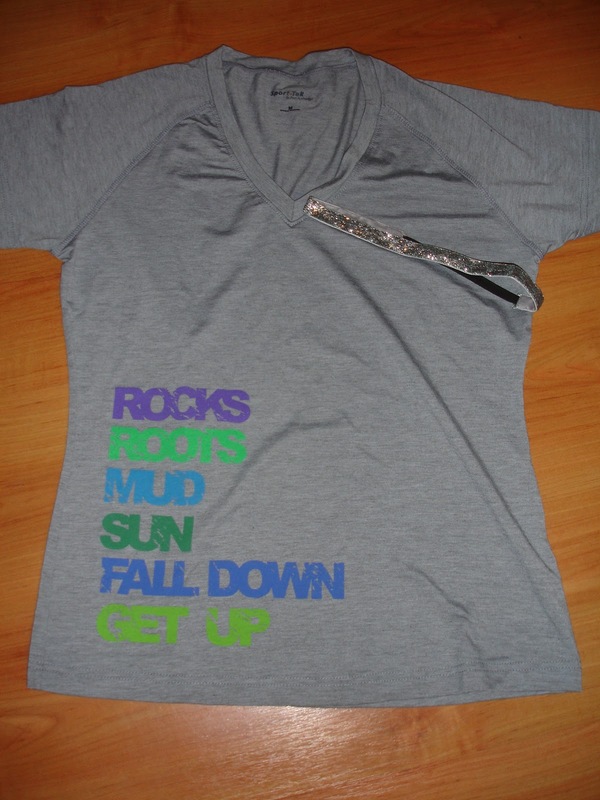 Event shirt. I manage to take bad pics! 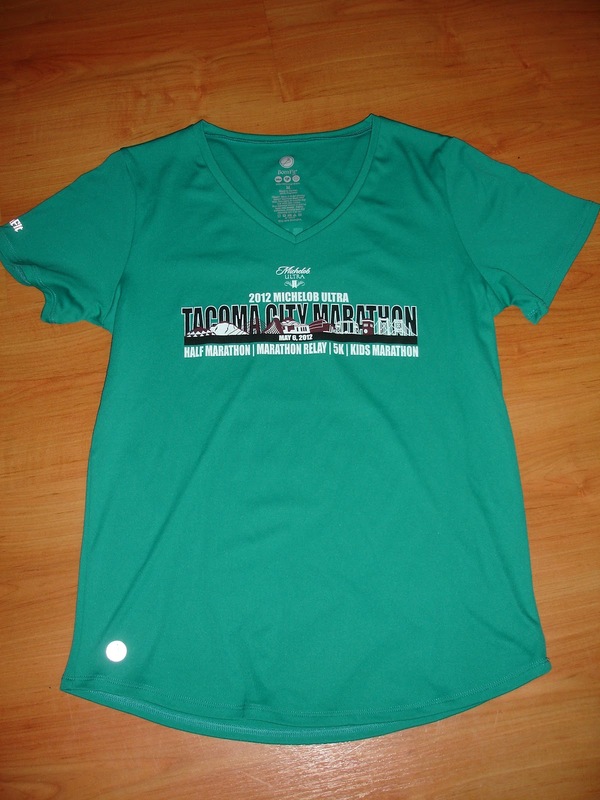 This pic makes the shirt look like a tent, but in real like if it is a girl cut, so it fits like a perfect glove, plus it’s V neck…do you know how hard it is to find V neck tech running shirts? It’s hard, so I’m supper excited about this thing. 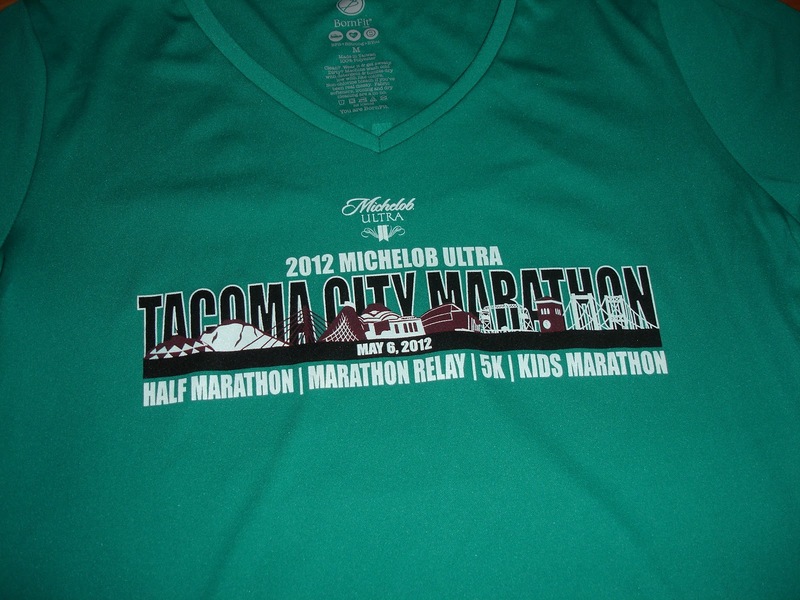 Close up of the logo on event shirt. 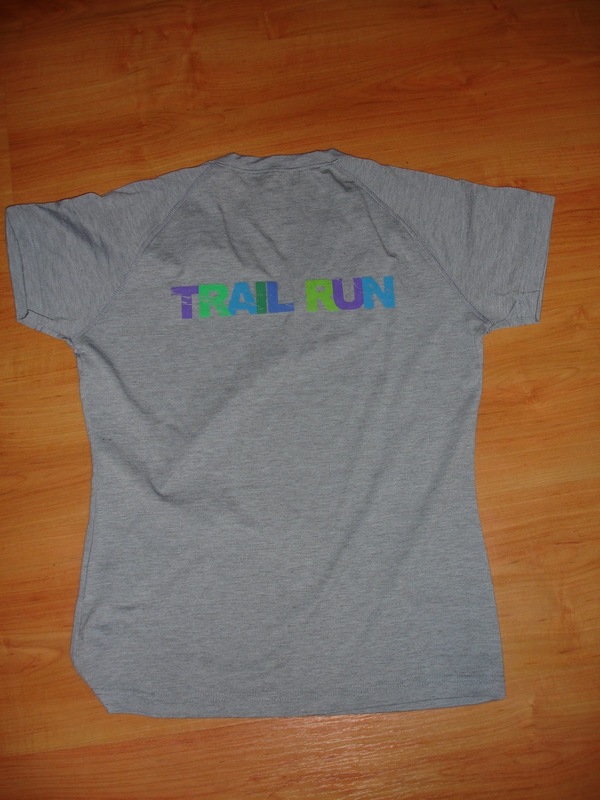 Back of trail running shirt. I trimmed my toe nails last night and painted them a pretty sparkly pink to go with the headband and socks. I know no one will see them, but I know they look pretty. What you can’t see is that the middle toe on the left foot is completely bruised black on the back side. I noticed it while working on my toes last night. Have no idea how or when it happened and it’s tender to touch, but can’t feel it when walking. Let’s hope I won’t feel it while running either. 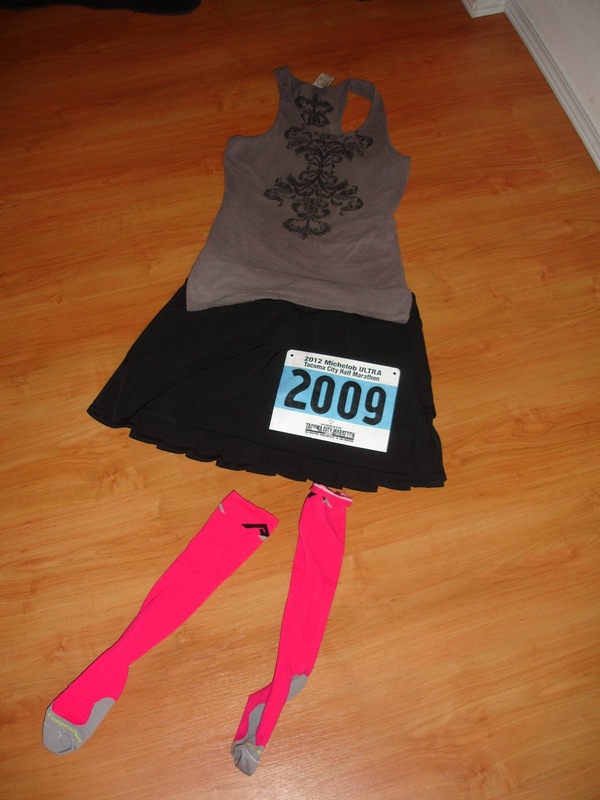 My goal for this race is the same as it was before my foot started bothering me…to finish in 2:30 or less. Based on my two longest training runs I’m on pace to finish around 2:20, and that is the pacer I will be using as well, which also happens to be the slowest pacer. If I have to take it down a notch my base line goal with every race is to finish and run the whole way, no matter how slow. However I’m not stupid, stubborn, but not stupid. I have some races lined up through September that I am supper excited about, so if at any point tomorrow I feel like my foot has crossed the line from just hurting to doing damage I’m done. It’s not worth messing up the rest of my summer. Having said that I’m going into this with the mind set that I will have fun, I will finish and I will make my time goal. I will post pics and post-race report sometime tomorrow afternoon. The fact that you are going ahead with this race speaks volumes about your identity, character,courage and drive. It's exactly like last sept. when I went into a full blown diabetic reaction ten minutes before the start of our 5K. Then I realize I had not brought any glucose. I got to run a race with my daughter. She got to keep me ging. Somehow you kept me from droping to the ground. We did it! You remind me of when I set the national record for bench press two years ago. Just three weeks before the contest I tore a pec. Everyone expected me to drop out (DNF). I had not competed at the national level at anything. I had trained so hard. When I set out to do something I like to do it. After all, it is not the results of the competition that matters most. It is the road you travel getting there. Enjoy the steps it takes to get there. Evereyone told me how stupid it is going to look with me just benching a hundred pounds at a national event. Wow–I still own the national record for my age group at drug free and gear free. This race will have its wow moments for you. Nothing but good will come out of this for you. I will be with you in spirit. I am proud of you. I really miss you. This thing with stan is devastating for me. Run your heart out.